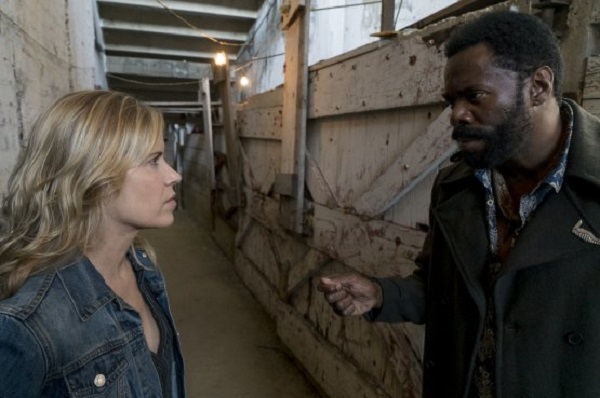 Last week on Fear The Walking Dead, Troy in his vengeful mode, unleashed a horde of zombies on his former home: the Broke Jaw Ranch. He didn’t have the foresight to know that his brother would suffer as well, so he and Nick spent the episode trying to rescue the survivors who managed to escape the horde and hide in the bomb shelter. Inside the shelter, Alicia had her baptism-by-fire and she graduated to “Carol” level for killing as she had to dispatch those infected to conserve air after the ventilation system went down. She then had to kill her fellow friends who died of carbon dioxide poisoning. We have to remember, she’s still a kid and this had dramatically taken a toll on her. So much that even after rescued by Madison, Strand, Nick, and Troy, she opts not to head back to the dam but instead to go out on her own. Madison asks Nick and Troy to go and keep an eye on her while the rest of the small group of survivors head to meet up with Daniel Salazar. All’s well, right? Turns out that Ophelia was bitten last week when she and Crazy Dog tangled with the zombie stuck in the ventilation shaft while trying to turn the air back on. While it looks like she was OK last week, this week begins with the revelation that she was bitten and running a high fever. As it was in the shoulder, it simply can’t get cut off like an arm or a leg. However, the deal with her father for the water was reliant on her showing up as well. Madison now needs to keep her alive long enough to secure admission to the dam. As a result, they all head to the Mexican trading post to secure enough supplies to keep her alive long enough. Walker, who has lost everything when his fellow Black Hat friends perished at Broke Jaw, just wants to tend to Ophelia. He knows his love doesn’t have long, so he does his best to take care of her. 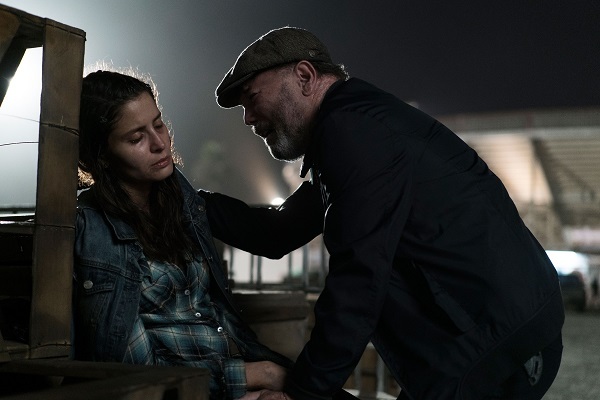 But with Daniel coming to the trading post (and Daniel being an overprotective dad), it might not be in the group’s best interest to see his dying daughter as well as her boyfriend. As a result, Walker spends most of the episode off-screen. 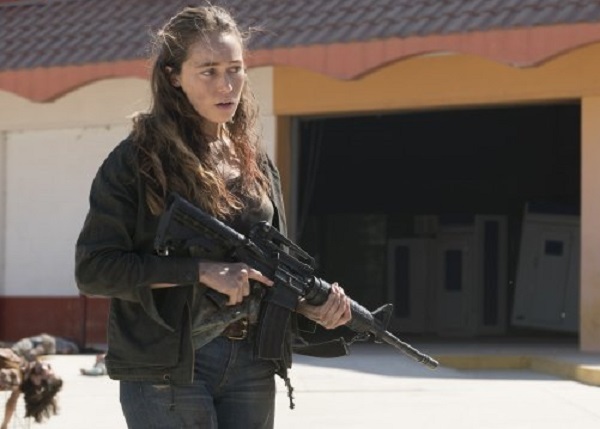 Meanwhile, Alicia is going the same route that Carol did in The Walking Dead, she’s opting for solitude. Having killed so many people she was in charge of taking care of, she thinks that going solo is the better idea. She quickly runs into Nick and Troy who want to bring her back. Alicia won’t budge and wants to remain on her own. She even convinces Nick that he’s better off solo and doesn’t owe their mother to stay with her if he will be better off on his own as well. Nick understands and he and Troy head back to the trading post empty-handed. Alicia continues her solo trek and goes into a fast food eatery to try and score some food. Of course, this is the apocalypse, so if the food isn’t spoiled, it’s been picked clean. However, a big bucket of potatoes was left behind on a shelf. After she helps herself to the potatoes, the eatery becomes overrun by zombies. She manages to hide in the jungle gym’s ball pit, only for a juvenile zombie emerges to attack her. After barely able to kill the zombie, she then hides to make sure the rest don’t get her. Just as they start to crowd up the place, someone new comes into the restaurant. 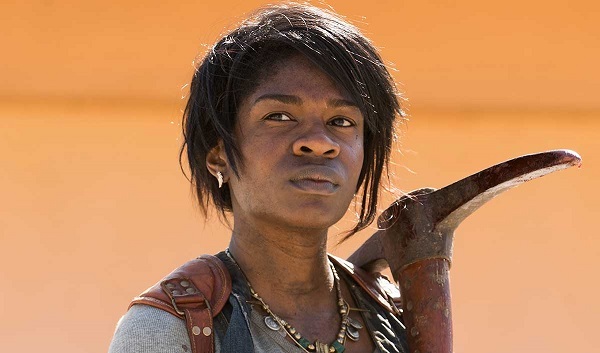 A woman wielding a pickaxe quickly kills the zombies and then does something peculiar. The mysterious woman takes out pliers and starts taking zombie fingers, rings, and gold teeth. Besides water, jewelry is probably still one of the best currencies in the zombie apocalypse. The woman then takes the potatoes as her prize and leaves the restaurant. Alicia wants her potatoes, so she’s going to chase after her. When Alicia catches up to her, she threatens to shoot her if she doesn’t get her potatoes back. However, this woman has been around the block. She wouldn’t have survived this long if she was not able to fend for herself. 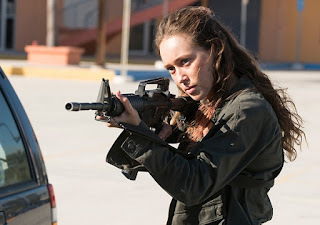 She calls Alicia’s bluff about killing her and then the two make nice while killing zombies. Looks like Alicia won’t be alone for long. Nick arrives back to the trading post where he talks with his mother who fell asleep keeping an eye on Ophelia. Madison is starting to crumble. Her daughter’s left her, Ophelia is going to die, what happens to her if her son goes on his own as well? Nick also secretly steals some of Ophelia’s painkillers. Looks like his drug abuse is about to kick back in. Meanwhile, Nick’s now in full relapse mode. He and Troy and getting a meal while he tries to score some uppers. Troy doesn’t seem to like two things: Mexicans and drugs/alcohol as he is uneasy around both, and there is an abundance at the stadium of both. Nick wants to score and requires Troy tag along as his wingman. After finding out where to get some drugs, the two ventures into the “drug den” of the stadium and run into the main dealer. The dealer offers the usual schedule 1 drugs, but Nick wants even more. The dealer offers something even stronger. He then shows him “pure adrenaline” and offers him the nucleus of the brain stem. The dealer never says what it’s a brain stem of, but I’ll just assume it’s a zombie. Nick goes forward and takes the shot, then peer pressures Troy to do the same. Then the two are tripping all over the place. Then opt to leave the stadium and walk the streets. Troy, even when high, is not completely on board with everything. They run across a zombie, which Nick kills and then smothers its blood on his face and body and does the same to Troy. Nick then walks towards a group of zombies outside. Troy learns that wearing zombie blood can allow you to walk with them and the two start walking through the pack and Nick in a drug haze is apologizing to them and saying “I can’t go back with her.” Madison has lost her other child at this point. Madison knows that the meeting with Daniel has come and she takes a barely alive Ophelia with her. They know she doesn’t have time and after she says goodbye to Walker, they go outside. Ophelia wants Madison to kill her as she doesn’t want her father to see her as a zombie. As the two hug for the last time, Ophelia passes away. Of course, 10 seconds later Daniel shows up. Madison tries her best to prepare him for what just happened literally seconds ago, but he’s clearly upset. He didn’t even get a chance to see his daughter one last time. Madison tries to comfort him, but he tells her to go or he’ll kill her. As she walks away, Daniel puts a bullet into his daughter’s brain before she can revive. Daniel confronts Madison the next morning, telling her that he buried her with his own hands. He still offers Madison to come to the dam if she and her group wants to. As they prepare to leave, Nick and Troy show up. Nick tells her he’s going to stay behind and set up a trading area to get things for her and the people at the dam. Even though it’s a nice gesture, Madison knows that he’s going solo as well. This time, she accepts it. As she, Daniel, Walker, and Strand leave for the dam, Strand looks out at the trading post. Did he give them up to Proctor John?